Sophisticated and stylish rolling business tote sets the tone for every trip you take. 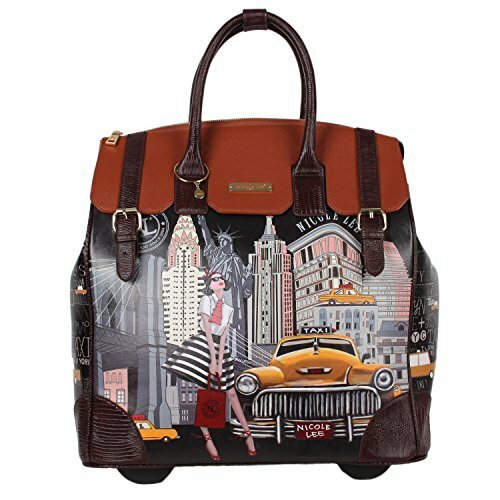 Exterior features: faux leather handles and trim, 2 front buckle embellishments, top zipper closure, back zip wall compartment for retractable handle, back wheels for easy rolling and Nicole Lee nameplate in front. Interior features: large storage space, zip wall pocket with metal Nicole Lee nameplate in front compartment, padded laptop compartment fits up to 15" notebook with velcro strap and giraffe print with NL logo satin lining. Dual top handles with 4 inch drop. Retractable handle extends up to 24 inches from the body. Dual top handles with 4 inch drop.